Throughout the last 23 years, we are proud to say that over 250 young women who lived or went to school in Washtenaw County have competed for the opportunity to be crowned Miss Washtenaw and utilize their scholarships towards completing their education. In addition to scholarships, the positive impact that the Miss America Organization has on the young women that participate is immeasurable. Our titleholders reach out into our community to promote their platforms as well as change the lives of the young girls that they meet! Established in 1995, the Miss Washtenaw County Scholarship Program is a local franchise of the Miss Michigan and Miss America Organizations and the first step toward the title of Miss America. Since its inception, the Miss Washtenaw County Scholarship Program has awarded more than $175,000 in scholarships to young women, giving them an opportunity to further their personal and professional goals. 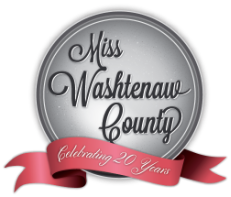 One of the main goals of the Miss Washtenaw County Executive Board has always been to ensure that each contestant who participates in the program will feel that she has not only competed for the title of Miss Washtenaw County, but for the title of Miss America. The hard work by the volunteers, quality venue, and strict attention to detail have made this organization one of the most respected programs in the state of Michigan. The young women who compete in the Miss America system are intelligent, articulate, highly motivated, caring, talented, ambitious, and hard working. They are passionate about their platform issues and are major contributors to public service. The Miss Washtenaw County contestants and titleholders exhibit these attributes. Seven Miss Washtenaw County titleholders have gone on to win the title of Miss Michigan, and one the title of Miss Illinois. Many other have placed as finalists, semi-finalists, and talent winners at the state pageant.